The Skyd All AUDL 1st and 2nd team players were selected based on the positive impact they made on their team and the AUDL regular season. Three handlers and four cutters are named to each line. Each team nominated up to five of their own players, and then five or more players from other teams in their conference. The 31 players that received nominations from at least two teams, which could include a nomination from their own team, were then taken into consideration. Then two lines were selected from the nominated players factoring in statistics, team performance, value to their team, and recognition from opposing players and coaches. Jonathan “Goose” Helton won the 2012 AUDL MVP, and has a compelling case to repeat. Whether it was throwing assists, catching goals, or getting D’s, Helton did it all this year, helping lead the Wildfire to a 14-2 record.. Helton was just one of two players with at least 30 Assists and 30 D’s in the AUDL this season, the other being Philadelphia’s Matt Esser. After the injury to Brodie Smith, Helton played an even bigger role in the Wildfire’s offense. Though he always played O-Line points when the game was on the line, after Smith’s injury he found himself playing O-Line more than expected, totaling 136 points there in all. For the second year in a row Helton had to step it up after an injury to Smith, and for the second year in a row he answered the call. “Philadelphia’s offense is run through Dave Brandolph. His quick throws and great timing opens up the field. His exceptional experience and field vision allow him to instantly find cutters when their marks are even the slightest bit out of position.” – Phil Watanabe, Toronto Rush player. Unfortunately the number that sticks out the most when looking at Brandolph’s stats, even more than his amazing number of assists, are his league leading turnovers. All those turnovers contribute to an 89% completion rate, lower than any other handler on the 1st or 2nd All AUDL team. But those turnovers don’t tell the whole story. First, 16 came in just one extremely windy game against Rochester, where both teams had completion rates below 75%. In that game Brandolph had to have the disc in his hands, since he was better equipped than any other Phoenix player to overcome the terrible conditions. Brandolph is the point guard for the Phoenix offense, which fits since he used to play basketball as a point guard. After playing with the Spinners last year, Brandolph stuck with the AUDL to play with the Phoenix this season. And it’s hard to imagine that the Phoenix would be where they are without him. “Considering the lack of scoring I see from Cincy, it’s amazing to me that he has as many assists as he does. He is a bright spot on an otherwise average team. He’s just so consistent and makes good decisions.”- Cameron Brock , Indianapolis AlleyCats player. Chris Powers may not have played on the most successful team, but when you look at his numbers it’s hard to argue with his spot on the first team. Not only did Powers have 74 assists, he had a 92.9% completion rate. For a handler with such a high usage rate that’s an incredible percentage. Only one other handler with 30 or more assists had a better completion percentage. One of the downsides to Powers game is that he hardly ever played on the D-Line, just 42 D points total, but as an O-Line handler, Powers was the complete package this season. High retention combined with big numbers. “Matt is definitely the breakthrough player of the Eastern division. Coming into the season no one expected much from him or Philadelphia but he definitely put both him and his team on the radar. Matt is a relentless cutter and a precise thrower. His athleticism is noticeable when he is making big grabs and celebrating them with a back flip. Look for his star to keep rising as he gets more exposure to the rest of the country.”- Mark Lloyd, Toronto Rush player. Matt Esser may have been the most complete player in the AUDL this season. The Phoenix leaned heavily on him this year too, Esser played 407 points, by far and away the most on Philadelphia. He played on both the O and D lines, and did everything for the Phoenix. Goals, Assists, D’s, big skies, smart decisions, you name it and Esser did it this season. His completion rate is a little lower than you might like from a cutter, but when considering the role Esser had to fill as the featured playmaker for the Phoenix, you can overlook the 86% completion rate. Esser was the only 30-30-30 (30 Goals, Assists, and D’s) player in the league. “One of the fastest guys in the league. His acceleration is what makes you work the hardest. The awareness he has to drift to the side of the field, then cut to the open field causes you to keep your head on a swivel the entire point.” – Neil Narayan, Cincinnati Revolution player. Keenan Plew is another player without elite level club experience that did damage and put up big numbers against some elite competition this year. Plew is the only player with 50 goals and 50 assists in the AUDL, truly amazing numbers. Plew made his defenders choose, force him deep and let him score or force him under and let him get the assist. It’s something said of many players in Ultimate, and quite a few named to this team, but it’s never more accurate than it is describing Keenan Plew. What’s really separates Plew from the rest of the top cutters in the AUDL is his completion percentage. Most of the top AUDL cutters that also look for assists (Lloyd, Carnegie, Wiseman, Esser, Lindquist, Burns) have completion percentages at 85% or lower. Not so for Keenan Plew, who boasts a 95.4% completion rate. And while he’s not a beast in the air the way his teammate Cameron Brock is, Plew can hold his own, and more often than not he is so open that he doesn’t need to sky his defender to pick up the goal. “Very tough to guard. Makes great cuts, turns upfield and makes good throws, but most importantly, he is one of the few O line players that works hard and makes huge D’s on a turn.” –Travis Carpenter, Indianapolis AlleyCats player. AJ Nelson makes life easy for the Windy City Wildfire. Matching up against his speed and height is extremely difficult, so many of the Wildfire’s opponents threw zone (especially early in the season) to prevent Nelson from getting open deep. When a cutter is so dominant that teams would rather throw zone on a 53 yard wide field against handlers like Bob Liu, Brett Kolinek, Ron Kubalanza, Brodie Smith (during the first half of the season) and Jonathan Helton, that is a great sign of respect. And even when those teams threw zone he still got open deep on occasion. 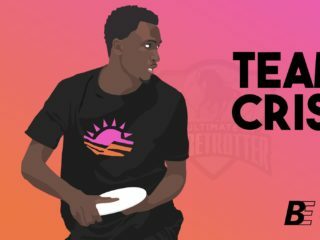 Plus, while Nelson doesn’t have the throws that you might expect from an All AUDL player, he’s smart with the disc and has better throws than you might think. He limited his turnovers, throwing at a 96% completion rate this year. The Wildfire wouldn’t have finished first in the Midwest without him. “His defense is phenomenal. His bids are outrageous. He is by far and away the best player in the east,” -Liam Shramko, DC Breeze player. Mark Lloyd has had to miss a number of games due to his Team Canada commitments, but whenever he was on the field he made big plays for Toronto. He either assisted or caught a goal on 31% of the points he played. To give you some perspective, AJ Nelson scored or assisted on 25% of the points he played. He came through with a D on 16% of the points he played. Husayn Carnegie only did at a 12% rate, and Jonathan Helton at a 10% rate. If he’d played the full slate of games, it’s likely that Lloyd would have been seen as the clear MVP of the AUDL. Even with those missed games, his cumulative stats are still impressive. Lloyd and Matt Esser were the only players in the league to have at least 40 goals and 30 D’s. “Andrew Brown has made his presence known in the AUDL. He is the anchor in the back field for the Radicals. He is practically unmarkable and more often than not the Radicals offense is started and sometimes finished by Brown,” – Tom Annen, Madison Radicals player. Looking at his assist numbers you might wonder why Andrew Brown is an all AUDL player. While it’s true that players like Tom Annen and Dave Wiseman rack up more of the assists for Madison, Brown is the player that makes their offense go more than anyone else. He’s a quick handler that gets open for resets and up line cuts more consistently than anyone else in the league. And when he has the disc in his hand, he makes the right decision. His completion rate of 97% is truly remarkable for a handler. He averages 2.25 throws per point, higher than any other nominated player, especially impressive considering that over a third of the points he played were on D-Line. “Thomson is the offensive backbone of the team. 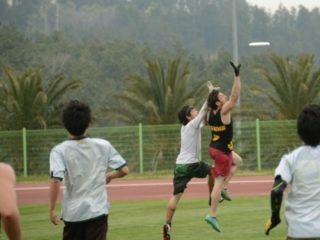 His ability to read the play and distribute the disc is unparalleled on the team and maybe the league. Thomson is the team’s leader in throws and touches with a 93% throw percentage and 99% catch percentage,”- Evan Phillips, Toronto Rush Coach. Thomson McKnight is another GOAT player that made his presence known playing for the undefeated Rush this year. On a team with so many interchangeable parts, McKnight has been a reliable O-Line handler for the Rush. On Toronto he isn’t playing the featured handler role that players like Chris Powers, Daniel Selwyn, and David Brandolph fill, because Toronto doesn’t need him to do that, though it doesn’t mean he couldn’t if called upon. He’s got a great flick that he can deliver with some serious zip on it, and sees the field very well. “Daniel Selwyn commands the DC Breeze offense with one of the highest usage rates in the league. Top 10 in the League for multiple stats, Selwyn has kept the Breeze in games with pinpoint hucks and buzzer-beaters, in addition to his signature scoobers on the goal line.” – Glenn Poole, DC Breeze player. Daniel “White Hat” Selwyn had to carry a remarkably heavy load as the go to O-Line handler for the DC Breeze this year. The Breeze only went 4-12, and their O-Line spent more time on the field than they would have liked. But they had a few players stand out for them, and none more so than Selwyn. Selwyn had 850 recorded throws, easily enough for the league lead. And making that even more remarkable is that number doesn’t factor in a two game road trip the Breeze took late in the season against Toronto and Rochester, which they didn’t keep stats for. And it’s not like all those throws were useless either, the Breeze counted on Selwyn to break zones, and looked for him to throw points on the goal line. Because he was more likely to take high risk throws, he ended up throwing a lot of turnovers (65) and his completion rate suffered a bit, ending up at 89%. Still, he was the only player with at least 50 assists and 25 D’s, an impressive number of D’s for an O-Line handler. Cutter: Cameron Brock, Indianapolis Alleycats. “He is one of the best athletes in the league. He out jumps and out sprints almost anyone on a deep cut. He also does an amazing job at timing continue cuts near the endzone and is able to score tons of points because of it.” – Travis Carpenter, Indianapolis AlleyCats player. Some have said that Cameron Brock is a one dimensional player. It is true that he’s an O-Line player that excels at getting open in the end zone, and his throws aren’t going to earn him any trophies. But the scouting report has been out on Brock for a while now, and his production hasn’t slowed down. In one of the most important games of the AlleyCats season, Brock showed he wasn’t just a one trick pony. Indianapolis was just 5-6, playing in St. Paul against the Minnesota Wind Chill, their primary adversary for the final playoff spot. The Wind Chill gave Brock wide open under cuts, making sure he wouldn’t get open in the end zone. They dared Brock to beat them with his throws. And he ended up throwing six assists, usually finding Plew in the end zone. 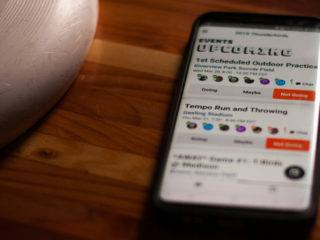 They weren’t breathtaking throws, but they went where they were supposed to and the AlleyCats ended up with a surprisingly easy 29-21 victory over Minnesota. And this past Sunday he ended the season with an eight goal game against Madison, finishing with a league leading 91. “Link is living up to his reputation as one of the best deep defenders in the game. Although not officially endorsed by the coaching staff he has a knack for baiting his check and the thrower into bombing it deep, only snare the disc at a very high percentage. His versatility of throws near the endzone is also a major benefit to the team. He routinely puts on an in game throwing clinic of less than normal break throws which are remarkably effective.”- Evan Phillips, Toronto Rush coach. Jeff Lindquist has been one of the top players on GOAT for years, and definitely didn’t disappoint in his first season on the Rush. He has nasty throws and is very difficult to beat in the air. This combination led to him scoring or assisting on 34.7% of the points he played, even better than his teammate Mark Lloyd. Lindquist is a complete player that would have been a first team selection had he been able to play more games. But just like Mark Lloyd, his overall numbers aren’t too shabby. He ended the season with 27 goals, 39 assists, 24 D’s. “Hurts you on both sides of disc. An intense defender who will punish you on the turn.” – Chris Powers, Cincinnati Revolution player. Shriwise is a Kansas State graduate that has been playing on Madison Club the last few years. He’s big, fast, and a great all around player. What separates Shriwise from similarly built and skilled players is that he sees isn’t nearly as turnover prone. Shriwise has a completion rate of 93.3%. The only cutters with better percentages on the 1st or second team are AJ Nelson and Keenan Plew. And Shriwise makes plays with his throws more often than Nelson does. He finished with 26 assists on the season, and though he wasn’t the Radicals flashiest player, he was one of their keys to success. “Wiseman is one of the biggest guys on the field for the Radicals as well as one of the best throwers downfield, wind or no wind. He has been an unstoppable force for the Radical offense. If teams front him, he’ll catch deep shots, if teams back him he will throw pin point hucks for goals.” – Tom Annen, Madison Radicals player. Dave Wiseman is more well known in the ultimate community than most players on this list, having recently led the Wisconsin Hodags to back to back finals appearances in 2011 and 2012. He was primarily a cutter for the Radicals, but a cutter that wasn’t afraid to take deep looks, leading to 49 assists. Wiseman also does a great job of using his height, and is extremely difficult to beat in the air. That advantage helped him get 26 D’s, more than any other Radicals player. Because of his huck happy nature he was more prone to turnovers, finishing fourth in the league with 52. His completion rate was 85%, not great, but not much different from players like Matt Esser or Mark Lloyd. In naming a team like this many notable players are going to be left off. Here’s a line that were all close considerations, though they weren’t the only close calls not to make it. Dave Hochalter was the engine behind the Mechanix this year, a handler that could get open deep. Tom Annen and Izzy Bryant both did great work as handlers for their respective teams, and were great leaders on the field. Timothy Burns had a fantastic year for Rochester, and his hard work shows when you look at his numbers. Cullen Geppert did a great job taking advantage of teams that paid too much attention to AJ Nelson, and helped dictate the offense for the Wildfire. Brian Schoenrock was the standout defensive player for the Wind Chill, and would get sky high for a lot of his d’s. Husayn Carnegie was the toughest player to leave off the list. He’s a great help defender that’s a highlight machine. His defense and amazing catches are the most important parts of his game, but he’s also capable of making big throws. In the end though, he’s just too turnover prone. His completion rate was just 77%, far behind anyone to make the first or second team. He turned the disc on 19% of the points he played. The final spot came down to Wiseman and Carnegie, and looking at the numbers it was difficult to justify putting Carnegie in ahead of Wiseman.